We appreciate it that HIS sent us this Multi-View+Sound USB adapter for review! The HIS Multi-View+Sound is HIS's latest USB multi-display device, which allows you to add an additional display device easily, even if you are out of ports on your video card or laptop. You can add up to six displays, with each additional monitor requiring its own adapter. These use a DisplayLink chipset; which exact model I am not sure, but if I had to guess, based on the specs, I'd say it was the DL-3100. These DisplayLink devices are unique in that they can add additional screens to virtually any PC, by streaming the video of an additional monitor via a unique video compression technology, through the USB port, to the video output. It works with the system's main video card to do so. This allows it to stream high definition video, in this case even higher than 1080p (2048x1152). It is supposed to support 1920x1200, but the adapter did not recognize my monitor, a SOYO 24” DYLM24D6, as the screen simply showed the solid color red. It did, however, work properly on both a 1080p LCD TV, and a home theater projector. This adapter supports displaying 3D games on the external screen, since the primary video card does all of the rendering. For the most part, it does work. However, you can tell that it compresses the video on the way out, and you can sometimes see MPEG-style artifacts on the screen, where you would not have been otherwise. I also noticed that fast action games, like Trackmania 2, severely drop the frame rate, and also have higher than normal artifacts. To be fair, Trackmania is not on the supported game list. I was surprised to see some very graphically intensive games, like Crysis, on the supported list, however. I am fortunate enough to have a laptop with built-in HDMI, and ATI 6850m video card with switchable integrated Intel i7 graphics, and USB 2.0 and 3.0, depending on the port. This means that I was able to test with many possible combinations, to see better the strengths and weaknesses of this device. What I found was confirmation that it does indeed use the main video card to do rendering. I tested using 3DMark06, and found that the Intel graphics performance was not too far off of the mark in the 3600 range, but on ATI, I found the score to be nearly 9500, where my laptop's native card performs in the ball park of 12500 normally. Considering the compromises, it's pretty neat, but don't expect native HDMI levels of performance. I was able to do some basic testing with USB 2.0, though most of it was via 3.0. I was impressed with how much worked, though frame rates clearly suffered. But for simply adding an additional monitor for additional work space, or simpler A/V needs, it would perform flawlessly. One thing that I was highly interested in was the sound capabilities. I am a bit of an audiophile, and I have a fairly modern home theater with HDMI audio/video capabilities. This is one of the first adapters, and the first from HIS, that supports multichannel HDMI audio over USB. This means multichannel audio can be added to virtually any PC with USB. It works pretty well, and in 5.1 mode multichannel FLAC files worked better than I expected. It did not sound quite as good as my laptop's native HDMI outputting at 24-bit/192kHz sample rate. The Multi-View+Sound only supports one sample rate, and that is 16-bit, 48KHz sample rate. This prevents it from being an audiophile choice in many cases, but for most average (and even above average) sound systems, it did an admirable job. If your standards aren't as ridiculously high as mine are, I think you would be very pleased with this, assuming no other HDMI or digital audio option was available on that PC. Unfortunately, during testing, the HIS Multi-View+Sound adapter's USB port snapped on me. I can feel that something inside of the box snapped, as the port swivels freely where it did not before. It's really unfortunate that my review sample had durability issues. Hopefully this is not a problem that is common with these devices. I will be filing an RMA shortly, and if anything noteworthy comes from the process, I will update this review accordingly. As a result, I wasn't able to test all possible combinations, but thankfully enough to get a pretty good idea of how it works. 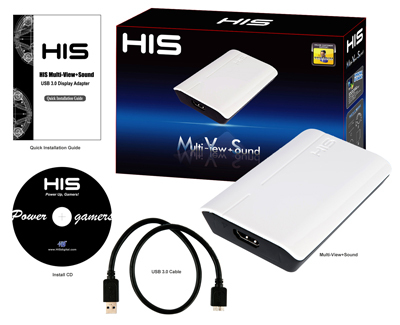 The HIS Multi-View+Sound USB 3.0 adapter is a really neat device that fulfills a specific niche: adding additional monitors to an existing PC, and doing so without having to add large or expensive video cards. It also conveniently supports most expected multimedia capabilities that modern computing affords us. While it is not without compromises, it does a much better job than I expected. Hopefully fragility does not plague this product line as it did for my sample.